Not that long ago, one of the local micro-rags (not the main newspaper) invited me — based on my [expired] reputation as a movie buff — to write reviews. I did decline without hesitation, knowing that whereas I do have a thing or two to say about movies, my depth and breadth beyond technique is shallow and narrow. Stephen and I watched ‘Never Let Me Go’ the other evening. For essentially a non-reader, I had read three of Kazuo Ishiguro’s novels, including this one, and decided the movie managed as matter of factly as possible a pretty hard-sell dystopia. This was my second viewing; I’m crazy about Carey Mulligan. We also watched ‘A Ghost Story’ recently. I suppose when you use the word ‘peculiar’ rather than ‘unconventional’, there is a drift to the negative, so I’ll just say ‘A Ghost Story’ is somewhere in-between. Starring Rooney Mara and nominally Casey Affleck, it provides an oasis of a movie where the camera is almost exclusively locked down with action confined within the frame. Also provided: very long takes, which in this case work well, with the exception of a marathon one involving a pie; desperation sets in for it to end. 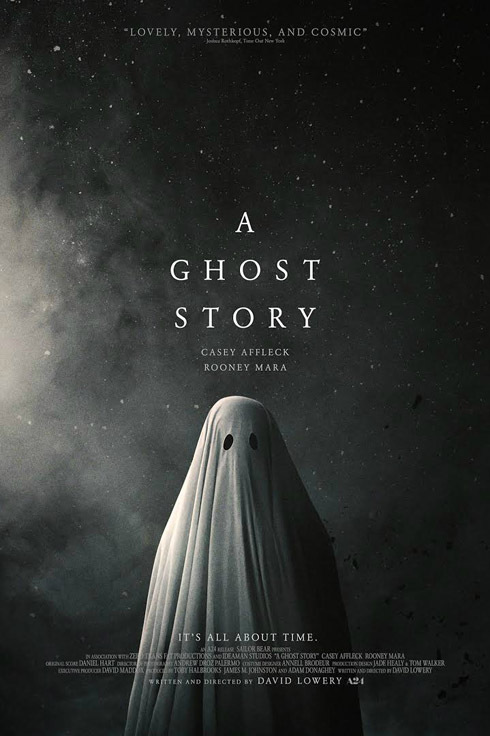 I say ‘nominally’ starring Casey Affleck, because after his character’s demise early on, he sports the getup shown in the poster below (except for one shot) for the remainder of the running time of the picture. Though the classic sheet with two holes seems like a really goofy idea, turns out the gamble is very, very effective. Sounds funny here, actually quite heartbreaking. I pity the poor fool, so to speak, who sees the poster and expects a thrillfest. One review I read calls the movie ‘a meditation’, and it does take some dedication to watch. Do I recommend it for your October viewing? That’s a very good question. That’s a very good blog entry.